In my research on dress in post-war Italy, people’s experiences of dressmaking were of course entirely different. Sewing wasn’t a pastime; it was an integral part of household management. Right up to the 1960s, the majority of households owned a sewing machine and even into the 1970s, it was customary in Naples for a woman to receive a sewing machine as a wedding present. Reading the post, I was reminded of both my mother and her sister — my godmother — whose sewing machines played a central role in both their households. My mum received hers as a present from her parents for her 24th birthday (1975). As a child I loved whenever her machine was taken out. One of my earliest memories is converting the up-turned lid of the cover into a make-shift rocking cot for my baby doll! Trained in making and cutting patterns, she made clothes, curtains and bed spreads, did alterations and was always on call whenever costumes were needed for the school play. She was also particularlyy talented at knitting, and the homemade jumpers and cardigans she knitted for me when I was a child always attracted compliments. 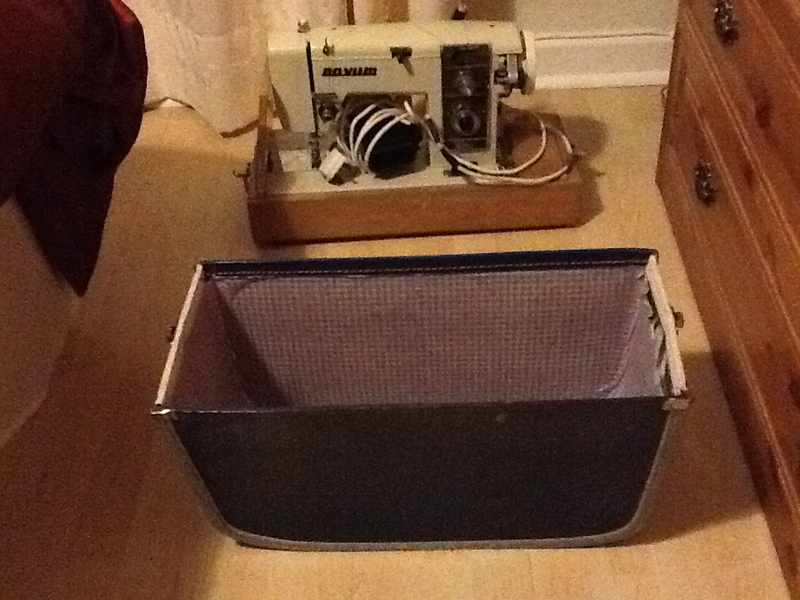 Sadly, the onset of arthritis in her fingers means that her knitting needles now lie discarded in a drawer, her sewing machine abandoned in the attic. That they have fallen into disuse, in some ways, seems appropriate: they are, after all, relics of times past. My mother and my godmother, were of, course, of a generation where women made their own clothing or used their sewing machines to alter clothes, creating new designs and looks. Mum frequently talks about how she’d buy lengths of fabric to create a new dress for dances at the weekend. 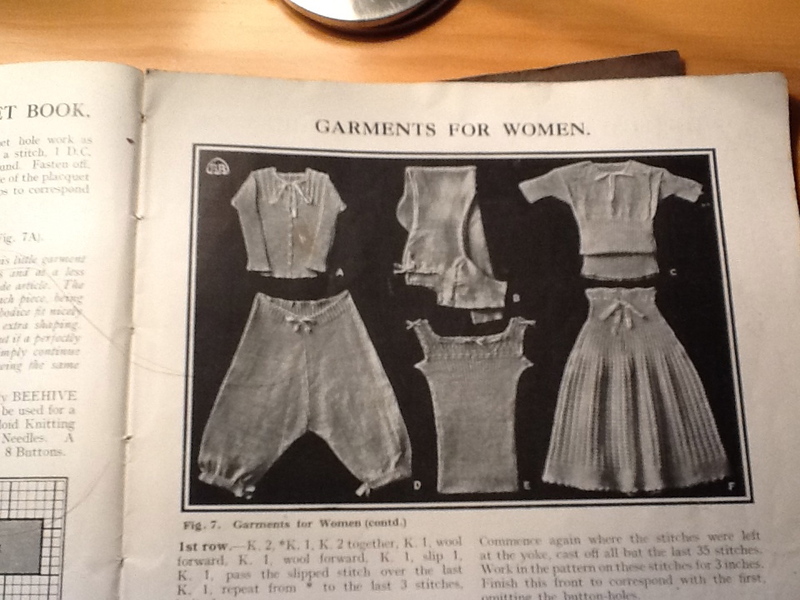 Because sewing, as Niamh Cullen noted, was an integral part of household management I wasn’t at all surprised to find a book of patterns among my grandmother’s belongings, which are turning into a real treasure trove of sources that provide an insight into everyday life. 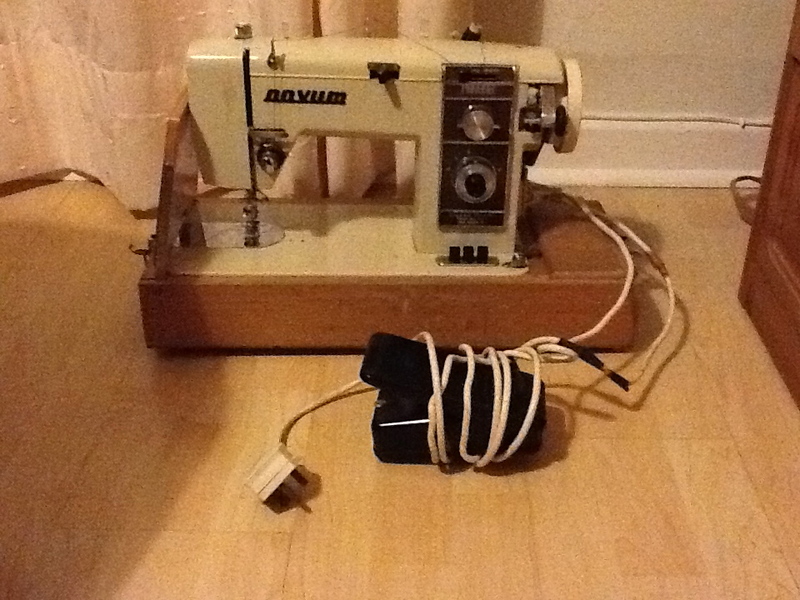 My Dad recalls his mother working on a pre-electric-powered sewing machine, which was operated by a foot pedal. 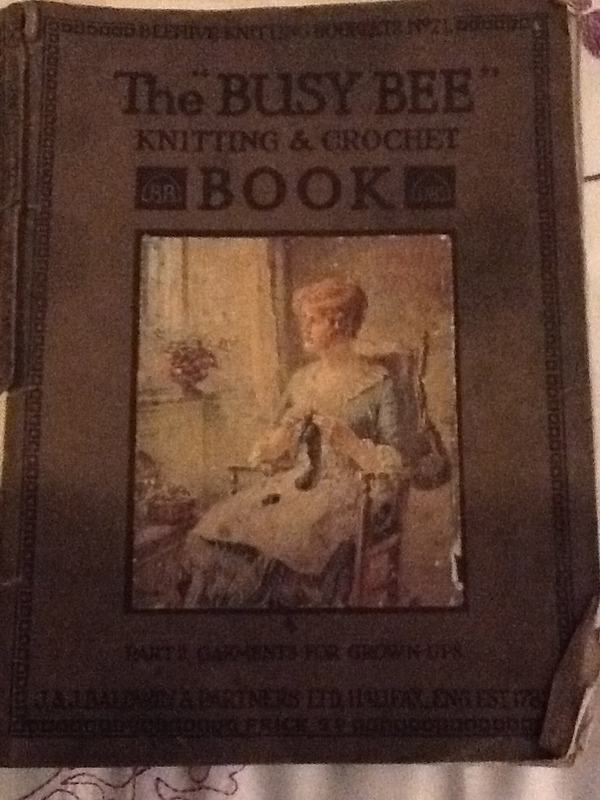 The Busy Bee Knitting & Crochet Book doesn’t offer quite the same social commentary as the Catholic guide for the young wife or the booklet advising against mixed marriages, which she also owned and I’ve blogged about recently, but it does give an insight into a certain style of clothing from a particular time period. 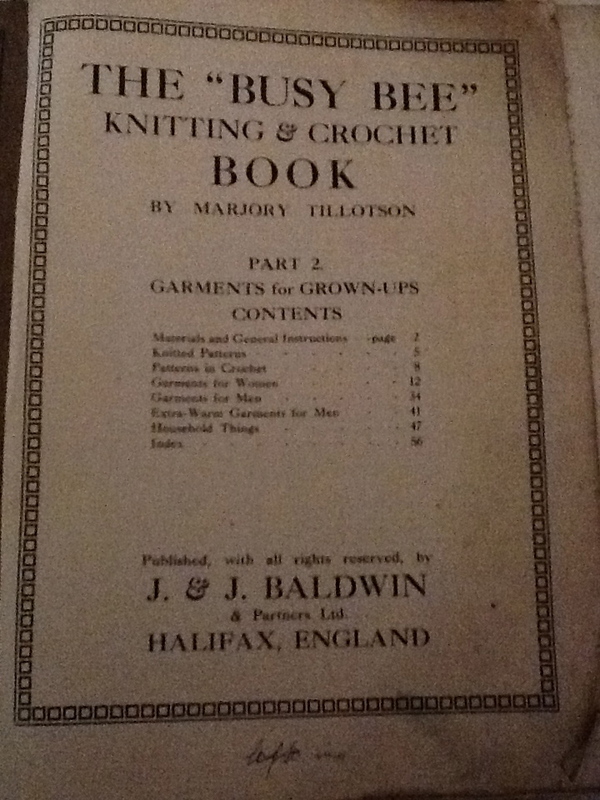 Published by J & J Baldwin & Partners, a supplier of knitting yarn, the booklet was number 21 in a series that also included patterns for infant garments, socks and stockings, a lady’s hunting jacket and sports sweaters. They give guidance on turning plain pieces of material into a myriad of creations. According to the catalogue of the British Library, this particular booklet was published sometime between 1915 and 1926. The beautiful coloured image on the front cover is somewhat Austen-esque. The booklet was fifty-six pages long and, as you can see below, this particular issue catered for ‘grown-ups’. A: Knitted bedroom slippers, B: Crocheted bedroom slippers, C: Light shoulder cape, D: Boudoir cap, E: Crochet dressing jacket, F: Slumber vest. Previous Previous post: Moving Day! Hello Ciara, I saw your post tweeted by ‘Irish Blogs’ so came to have a read. It’s a very interesting post and your mother & godmother sound very talented. There is a huge resurgence in sewing, knitting & crochet, and with it quite a demand for what is seen as ‘vintage’ rather than relics 😉 The sewing community as reflected in social media is very vibrant and so many people are altering and making their own clothes again. Perhaps there’s a more enjoyable element to it now, as many of your mother’s generation felt they ‘had’ to do it so stopped when clothes became easily accessible & cheaper. Hi Angela, thanks for stopping by. Niamh (quoted in the post) had mentioned to me alright that there sewing was growing quite popular again, but I had no idea. While I’m reasonably adept with hand sewing, I’m somewhat in awe of those who can work the sewing machine. I definitely think you’re right about the fun element having the appeal. As with anything, compulsion / necessity tends to kills off any enjoyment. 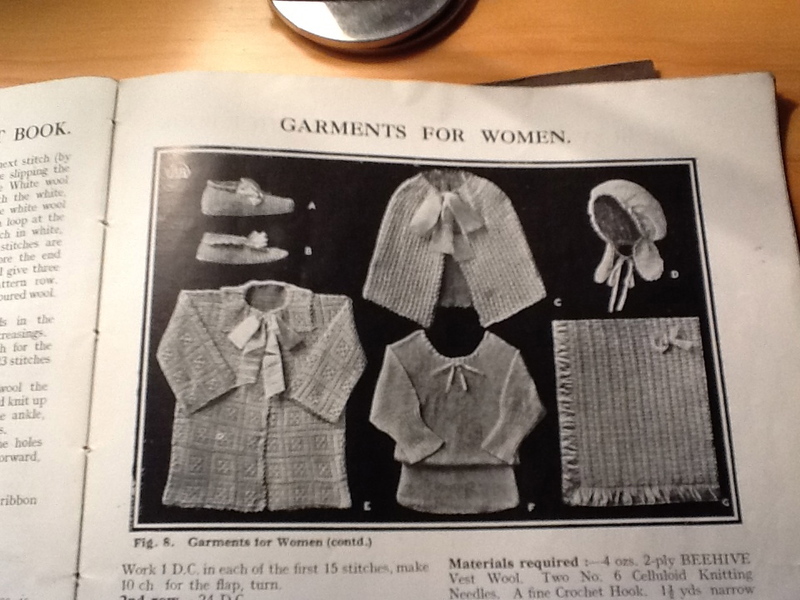 Really interesting post Ciara, your grandmother’s pattern books look fascinating! Such rich sources. There is definitely a resurgence in interest in knitting, crochet and sewing these days. I’m not sure why it’s becoming so popular again now but it is interesting to think about the timing – possibly the recession making people more appreciative of things that can be made by hand? And definitely now there’s in element of choice or making things for fun rather than necessity. I’m knitting a pattern from a book of vintage patterns from the 30s to the 1950s at the moment… the designs are so pretty and unusual! @thelittlerview: Niamh, I love the idea of re-creating looks from the past. I’ve just gotten involved in a new food-related oral history project where one element of it will see the favourite recipes of those interviewed cooked. There’s something quite satisfying about bringing history to life.